The training offers self defence personal safety activities for Women’s and Youth groups, Corporate Team Building, Hen and Birthday parties. Activities can be tailored to offer a bespoke package. 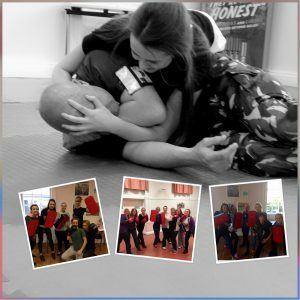 Team Building / Group Self Defence activities can really make a difference and help build positive camaraderie, confidence, introduce and build new relationships, break through boundaries and barriers. It has been proven that an environment that challenges people out of their comfort zone, pushes and stretches them, can be a hugely positive experience enabling individuals to shine, often surprising and impressing their colleagues / friends with sides of their personalities that are not visible in a work or everyday situation. 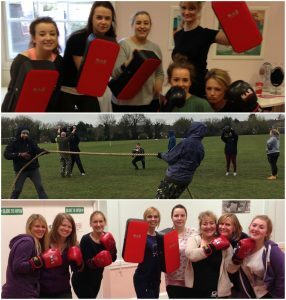 Self Defence group activities in and around London and Essex. The events can be used for networking, as product launches, staff morale builders, Hen Birthday parties and team bonding and can be run for either Women only, Youth or mixed Adult groups. Employees will feel valued, all attendees will actually be learning valuable life skills in self defence and personal safety. 1) 30 minutes of Theory covering reasonable force, personal safety, the system and legal considerations, followed by 1.5 hours of Practical covering distance control, voice commands, protecting the head, restraining an attacker standing up and, if time allows, standing knife defence skills. The session finishes with ‘pressure testing’ – teaching the ability to avoid “Freezing” in an attack situation. Maximum 15 attendees at a time. Attendees can develop their skills further by attending various weekly sessions in Essex. Contact Richard Mitchener to find out more on personal safety, self defence London & Essex group events.